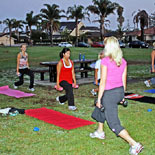 Find personal trainers, fitness camps, exercise classes & health clubs in Orange County. You'll also find information on living a healthy life through nutrition, weight management & help in quitting smoking. Available courts for basketball and volleyball. Training for Futsol, basketball, volleyball, adult open gym, table tennis and more. Located right off the 5 freeway at Bake Pkwy. The YMCA of Orange County has five fully-equipped family fitness centers with programs ranging from Yoga and Zumba® to functional intense training and personal training. A healthy lifestyle is right around the corner! The Goodwill Fitness Center centrally located in Santa Ana, CA, is specifically designed to serve people with physical disabilities or chronic illness. 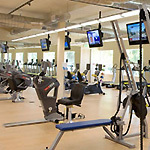 It is fully outfitted with the finest accessible fitness equipment and staffed by trained fitness professionals. Our members take advantage of cardiovascular and strength training, yoga, one-on-one personal training, and classes designed for people with various mobility challenges, as well as classes on nutrition and wellness strategies. Specializing in Iridiology, Food Allergy, Digestion issues, Nutritional deficiency, Weight Management, Detoxification, Hormonal Imbalance, and Skin Rejuvenation with integrative medicine approach. Dr. Shari, a Doctor of Traditional Naturopathy, will help you achieve your best in appearance and good health. After a non-invasive holistic health evaluation, you will be advised on a holistic health lifestyle to help reduce pain in an integrative natural way. Make an appointment now, before it's late, Call 949-500-2984. We offer 30% OFF for the FIRST appointment for new clients. Orange Coast Women's Medical Group offers a comprehensive weight loss program that is doctor trusted and proven. Medication for the control of appetite can be an effective aid to weight management when part of a comprehensive nutritional and exercise program. Our innovative 12-week program teaches permanent lifestyle and behavioral changes that promote stable, long-term weight loss. When meeting with a nutritionist, a careful review will be undertaken to determine particular information about your current diet and medical condition. The dietitian will work with you to formulate a plan that fits your needs, lifestyle, and budget. Your dietitian will also review your fitness level and make recommendations. Like your food selection, your individual fitness plan will help you achieve your health goals. The Orange Home Grown Farmers & Artisans Market is a Saturday certified farmers market operated by the non-profit Orange Home Grown, Inc. The market features a large selection of fruits, vegetables, nuts, mushrooms, honey, free range eggs, grass-fed beef, poultry and milk, and seafood,, fresh bread & baked goods, preserves and more. Enjoy complimentary coffee and music while you shop. Renaissance ClubSport makes it easy to fit healthy living into your busy schedule. With personal trainers offering one hour sessions, you can customize your training to include aspects such as posture assessment and sports specific training. Their personal trainers measure body weight, body fat, blood pressure, heart rate, flexibility, and cardiovascular fitness with great accuracy all in a single visit. The collected information will allow you to manage your health and fitness with optimum efficiency. Total Training by Tammy offers Personal Fitness Training in Irvine, Newport Beach, and throughout Orange County as an ideal option for those who prefer an individually customized training program. Their personal training programs are specifically tailored to meet your individual fitness needs whether you are looking to lose weight, build lean muscle, or simply want to tone up. American Martial Arts Academy offers a unique program combines the power of your body and strength of your mind to increase energy, strength, stamina, physical health and self-confidence. It also kick-starts the fat burning process, tones your body, reduces stress, clears your mind and cleanses your spirit. Great Alternative to Traditional Gym Workouts! Rockreation has been a local resource for the climbing community for training and education for over twenty years. Within our walls we have grown as the sport of rock climbing developed from a little-known activity to an internationally appreciated sport for kids and adults enjoyed at various levels of difficulty.